Who is Bernadette Fox? The mothers at the charter school where Bernadette's daughter Bee attends don't have an exact answer. They've seen the elusive Bernadette briskly drop Bee off at the school, but she is noticeably absent from any kind of extra curricular activities. One of the mothers whose home is located directly on the edge of Bernadette's dilapidated estate is particularly curious. Audrey Griffin likes to think that she embodies all of the characteristics of a woman in modern suburbia. She has a loving husband who provides for her and her son Kyle. This affords her the time necessary to devote to taking an active role in her community, a job she takes very seriously. As she prepares her home to host a prospective parents brunch for her son's school, she notices that her neighbor's blackberry vines threaten to invade her yard. If Audrey doesn't find a way to get Bernadette to eliminate the blackberries in her own yard, they will certainly make their way back to Audrey's garden and ruin her event. We learn about Bernadette through a collection of correspondence compiled by her daughter bee. We discover that she's an acclaimed architect and recipient of the MacArthur Genius Grant. She resides in a dilapidated building in Seattle with her daughter, Microsoft employed husband Elgie, and their goofy dog Ice Cream. Her family loves her, but in recent years Bernadette has become a recluse. Now she relies on her Indian assistant Manjula to manage her daily affairs. As we make our way through the various messages, we learn more about the woman, the events that stirred her disappearance, and piece together the clues to find out where she has gone. 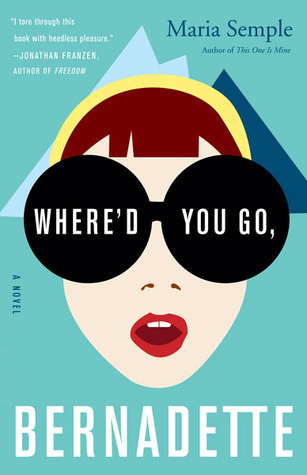 Where'd You Go, Bernadette is one of the rare novels that seeks to provide satire and actually achieves it. Author Maria Semple, who is notable for her writing on Arrested Development and Ellen, turns the mundane observations of suburban life into a whimsical and sharp social commentary. By revealing most of the story through letters and emails, Semple maintains a brisk pace that provides just enough details to hold the reader's interest. I found the abandonment of this style in favor of a more traditional narrative towards the end of the novel to be a bit jarring. I was so accustomed to the quick succession of messages that the more straight ahead approach seemed a tad out of place. Refreshing in both content and style, Where'd You Go, Bernadette is ultimately about the importance of family and embracing each others differences. I thoroughly enjoyed reading it and can't wait to see what Semple has to offer next. This entry was posted on Thursday, April 14, 2016 and is filed under Drama,Family,Maria Semple,Mystery,Novel,Satire,Where'd You Go Bernadette. You can follow any responses to this entry through the RSS 2.0. You can leave a response. I love the methods in which she delivered this story Ethan. I love the message of embracing differences and the importance of family. I agree. It is such a refreshing message of positivity!